Have you been charged with unlawfully possessing a firearm or other deadly weapon in Massachusetts? If you or someone you know has been arrested for any weapon-related crime or gun charge in Massachusetts, it is crucial that you contact an experienced Weapons Defense Lawyer as soon as possible. If you are accused of carrying a gun or an unlawful weapon, you are facing serious consequences. In Suffolk and surrounding counties, prosecutors aggressively prosecute criminal activities involving firearms, since crimes involving firearms carry mandatory sentencing. Thus, few plea bargains are offered for cases involving the illegal carrying of a firearm. 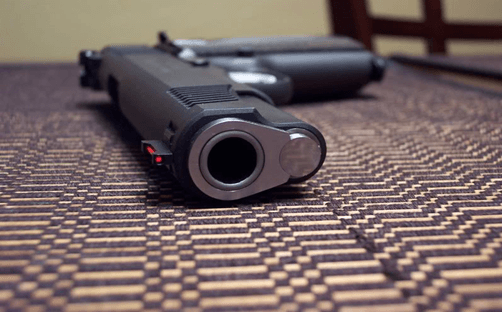 This makes it extremely important to promptly retain an experienced criminal defense lawyer once you are accused of carrying a firearm or other dangerous weapon violation. MGL c.269, s.10. Carrying dangerous weapons; possession of machine gun or sawed-off shotguns; possession of large capacity weapon or large capacity feeding device; punishment. Subsection (j) prohibits carrying a weapon on the grounds of a school or university. Stakes are high in any criminal matter. This is especially true in gun cases, where mandatory minimum sentences may remove any opportunity to negotiate a plea bargain with a prosecutor or judge. Careers are often derailed or ruined when a weapons charge results in a mandatory prison sentence. Other weapons charges focus on the weapon itself such as owning a handgun without a permit, possessing an unlicensed gun, failing to follow gun sales regulations, possessing a machine gun or assault weapon, or unlawful possession of a fake or imitation handgun with intention to use it illegally. Was the gun discovered by the police as a result of an illegal search? Seek the most aggressive criminal defense attorney you can find if you have been charged with a weapons crime of any type. Even though a citizen of the Commonwealth can lawfully obtain a permit to possess a firearm, there are still a number of restrictions about when and where you can carry a gun. From knives and switchblades to guns and other firearms, there are serious consequences for weapons crimes, including jail time and the loss of gun rights. The client, a 34 year old father of two, hired Boston Criminal Defense Lawyer Steven J. Topazio after he was arrested and charged with carrying a loaded firearm without a license. Attorney Topazio was the second attorney on the case after prior counsel was unable to negotiate a favorable resolution for the client. According to the police report, Boston Police were called to the home of the client’s girlfriend for an alleged domestic violation. The client allegedly threatened his girlfriend’s father and was thereafter arrested on an outstanding arrest warrant when he was found to be in possession of a Phoenix Arms .25 caliber semi-automatic firearm. According to the police report, when officers were removing the client from the residence, they ran a warrant check on him from their MDT and discovered that there was an outstanding warrant issued on the Defendant, and he was arrested on that warrant. The police conducted a search incident to a lawful arrest and discovered the firearm with 5 rounds in the clip and one round in the chamber. The client was read his Miranda rights and then asked if he had a license to carry and the client refused to answer. Carrying a firearm is punishable by a sentence of not less than 18 months, nor more than 2 ½ years in the House of Correction, with the offense of carrying a loaded firearm, (with ammunition in the weapon or feeding device), as an enhanced penalty of not more than 2 ½ years in the House of correction, such sentence to run from and after the expiration of the sentence imposed for the underlying carrying charge. Attorney Topazio filed a motion to suppress the firearm and argued it before the court. Attorney Topazio was aware that the Commonwealth recommended a sentence of 2 years committed with two years’ probation suspended on the enhanced penalty charge from and after the 2 year committed sentence. Prior to trial, Attorney Topazio persuaded the prosecutor to dismiss the enhanced weapon charge on a change of plea whereby the client would serve the mandatory 18 month committed sentence instead of 2 years committed, and the court agreed. Result: Enhanced charge dismissed and client accepts a mandatory minimum sentence of 18 months committed avoiding a more severe sentence. The client, a 32 year old full-time student attending the University of Buffalo, Buffalo, New York, anticipating receiving my BS in business Administration with a concentration in finance, had a CORI which reflected a one year committed sentence for possession of a firearm and malicious destruction of property, hired Boston Criminal Defense Lawyer Steven J. Topazio to seal his record. The Client who is presently employed with UBS Financial Services, Inc., in buffalo, New York, BSA operations and served honorably in the United States Army and who has been an active duty soldier at Fort Hood, Texas and a National Guard member for both Massachusetts and Texas, required a clean CORI because CORI checks have to be completed as part of the Client’s responsibilities as an employee with UBS Financial Services. Today, Attorney Topazio caused his client’s criminal record to be sealed. As a result, by statute the client can now truthfully state for all purposes that he has never been arrested or charged with any crime. Result: Criminal Record Permanently Sealed. The defendant was taken into custody on November 4, 2007, by Boston Police for questioning. While the defendant was in police custody, Boston Police searched his home and found a firearm secreted in a dirty white sock inside a barbecue grill located on the first floor back porch. The defendant was arrested for possession of a firearm. Possessing a firearm without a valid license is punishable by imprisonment in the state prison for not less than two and one-half years nor more than five years, or for not less than 18 months nor more than two and one-half years in a jail or house of correction. As a result to the search, Attorney Topazio who represented the defendant, moved to suppress all observations made of the defendant, all statements made by him, all evidence of every name, nature and description, whether tangible or intangible, seized from his person or his residence, including but not limited to the firearm, during a warrantless search by members of the Boston Police on November 4, 2007. After a lengthy suppression hearing, the Court denied the defendant’s motion to suppress evidence. After the court ruled against the defendant on his motion to suppress, Attorney Topazio marked the case for trial. Today, at trial, Attorney Topazio was successful in getting the Court to dismiss the gun charges against his client. Result: Case dismissed at trial and defendant avoids a mandatory 18 month jail sentence.